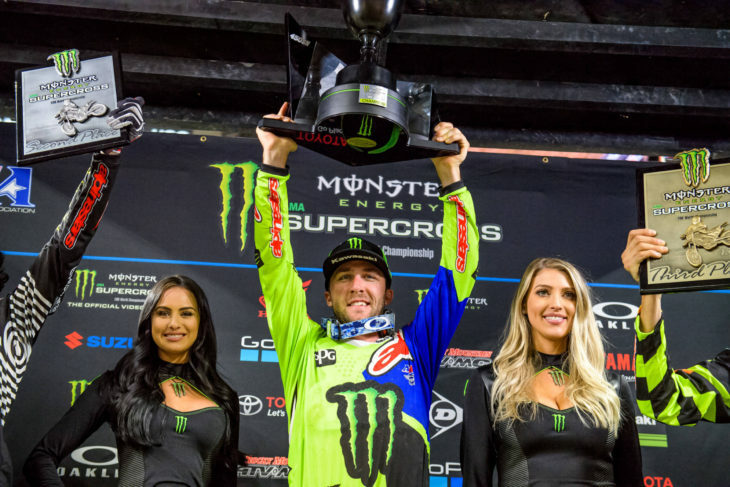 If you doubt whether “consistency wins championships” just ask Monster Energy Kawasaki rider Eli Tomac. In the 450 class, Tomac wins races much more frequently than any other rider … 9 last year (when Ryan Dungey was crowned champ with just 3 victories) and 8 this year, where Tomac finished third in the championship behind Husqvarna’s Jason Anderson (just 4 wins) and KTM’s Marvin Musquin (also 4 wins). Tomac, obviously, has had a problem with consistency. This year, in addition to a DNS at the Houston round, Tomac recorded a 13th place finish, a 15th place and twice finished 22nd. Tomac’s 9 wins last year ties the record for the most wins by a rider who did not win the championship (the other rider was Damon Bradshaw in 1992). Follow this link for a good summary of the race performances this year by the top 3 riders. 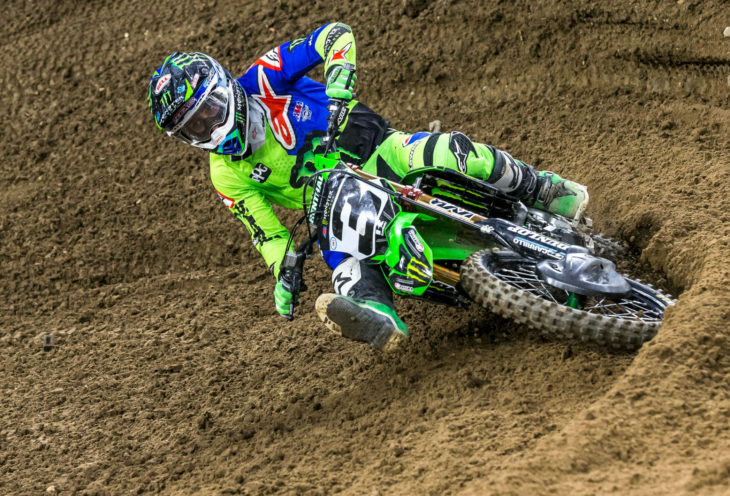 Tomac can take away his victory in the Supercross Triple Crown this year as consolation. Tomac is the first rider to ever win the Triple Crown, which he clinched in Minneapolis. The Triple Crown has been called a “championship within a championship”, and combines scoring from 3 venues under a unique race format for each of those venues. Tomac, the son of legendary mountain bike racer John Tomac, is just 25 years old, and presumably will have several more opportunities to win an AMA 450 Supercross title. Tomac did win the 250 Western Region Supercross championship back in 2012, and has two outdoor motocross championships to his credit. Tomac holds his Triple Crown championship trophy in Minneapolis. I have been riding for well over 40 years, raced all the way up to a Loretta Lynn Qualifier at age 13 (current age not disclosed, Lol). I will never understand why the tracks can’t be made safer, some of the youtube clips of Rick Johnson battles were exciting to watch on tracks with NO triples. I also think endurocross is exciting to watch and seemingly less dangerous than Supercross. In other words, the do or die jumps isn’t what makes the average person watch, I don’t think the average viewer (non-rider) even realizes how big a 70′ triple really is. Apparently the promoters think it’s all needed though. As far as ELI goes, he does seem to have nerves when he is in the championship lead, but wow who wouldn’t at the very top level. I think hes over it now, and has the youth to get a 450 Championship or two, or three. It seems like, in addition to some good points brought up here, a big variable that is not always skill-determined, it the first corner. I think almost every rider has met some kind of havoc in this area that has caused them delay or the win, in some cases at no fault of their own. The people who promote Supercross love showing clips of carnage, so I don’t see anything changing there. I personally would like to see a road race style grid with multiple rows. We would get a lot more close battles between title contenders. The California Motocross Association has used grid style starts for their “bounty hunter” Supercross races, and it works fine. I’m actually really surprised that the Manufacturers don’t make this a bigger issue, but I guesss they figure they can just make a faster bike than the small teams. hands down the class of the field, both on and off. His parents and a Colorado upbringing keep that boy humble and focused. His time will come, he may not win the most championships, but if he sticks with it, i reckon he will challenge for overall wins in category. Of course consistency is key. Someone mentioned James Stewart as an example of speed without consistency. Stewart did win 2 Supercross Championships and 1 outdoor championship. The year he won the outdoor title, he won every single race. He also spent a lot of time on the sidelines in his career with injuries. For me a good example of a rider with terrific speed coupled with a propensity for terrible crashes was Trey Canard. When he was healthy he was as fast as anyone, but he sure did crash a lot. I always rooted for him, but was almost afraid to watch his races. James Stewart is 5-time national champ: 2 x 125 outdoor in addition to what you mentioned. Also supercross world champ and 2-time regional 125 supercross champion. That is eight championships. Lots of consistency in there. He is only mentioned as inconsistant because his potential was even higher! I’m firmly in the JS inconsistency camp. Given how long his career was, and how much faster he was than everyone else, his title count should be at minimum, double what it was. In his era he would sometimes fall in the 1st turn and still win by 30+ seconds. Eli is on his way to the same legacy. Most wins, fewest titles, and issues I don’t recall ever seeing (twice had to cut his front brake line to continue?). I really think he can turn it around, though. So Stewart should have 50% more wins, titles and so forth than anybody else in the history of the sport? He already has the second-most SX wins, most 125 wins, a perfect season outdoors 28 wins out of 31 125 outdoor races, Title or several in every class, etc, etc. Tomac is nowhere near the winningest rider. He has 19 SX wins. A long, long way to “most wins”. Dungey who was supposedly just a podium rider has twice that in 8 seasons vs. Tomac’s 6, Villopoto has the same number of seasons as Tomac, but more than twice the SX wins. Stewart has almost 3 times as many wins, McGrath 4 times. And all those rides had strange issues, running out of fuel, chain derailing in SX, etc, etc. Everybody has. If you want to place Tomac (as of now) somewhere, its Windham. That can change. Being a great rider does not guarantee a championship, just ask Travis Pastrana and James Stewart; consistently fast riders able to ride at a 10/10 pace that also consistently crash-out of races in a spectacular fashion. What’s more important – to be the fastest guy on the track, or the best compensated? The money goes to the guy with the red plate. The fast guy is usually nursing an injury talking about next season and how it’s gonna be different. Consistency does win championships. Andrew Pitt won his first World Supersport championship with zero wins. Tomac wasn’t happy with the Musquin pass a couple races back but Tomac pulled the same move on Cooper Webb earlier in the year. Look what Zach Osborne did to Joey Savatgy last year on the last lap in the last race and won the 250 east. Took him out and won the championship. I hear lots of people saying how Tomac lost the championship because of one crash or one or two bad races. That is not true. Musquin might have, we don’t know how much Anderson had in the tank. But Tomac lost by a lot more. He was out of the championship before the Marvin incident at round 15. Marvin was not. And if you are ok with Tomac’s tactics last year I don’t know how you can blame Musquin for grabbing those three points right there. You answered your own question, Tomac was out of the championship. Marvin was still in (and with Anderson having problems next race, Marvin gained much). I didnt like it when Tomac tried to cheap shot Dungey last year, he wasnt passing, just trying to take him out. Marvin was going for the win. I think we are on the same side. Tomac was making a statement. He is one of the fastest. We all talked how Stewart was “fastest”, but crashed too much, I dont think if he rings his bell again, he will survive. Tomac needs to settle down, I think he could win a championship. I think we are on the same side of the argument. But still, a few observations. I didn’t realize that I posted a question. I made a statement: both Tomac and Musquin had bad races at the beginning of the year. Other one was flashy and fast and made statements. The other clawed his way back to the title hunt. Also, I wouldn’t ever compare the multi-time champion and the man with a perfect (!) outdoor season to Tomac. At one point (in 125) Stewart really did win of crash. That is not a figure of speech. Tomac has those mediocre races also. And not mediocre like Dungey or Villopoto, mediocre like Barcia or Brayton. I think it would help him if they de-tuned his bike a bit. He’s blazingly fast in the sand, and tracks with perfect traction, but it seems like he loops out a lot. Also, when he’s getting going after a crash sometimes he seems like he’s stuck in slow motion.. like it literally takes him 60 seconds to remount his bike and get going again.. Waay too much time to give up in a pro race. People forget that KTM made Musquin let Dungey pass in the race prior to get enough points to get the championship, that’s why Eli was behaving like he was in the last race, having a “adult tantrum” as you call it. The entire Kawi team was ticked off. Tomac is by far the most popular rider on the circuit. I remember the race well when Musquin let Dungey by. The whole thing was handled poorly by KTM who should have said from the start it was a planned move to protect a championship. I believe it is allowed by the rule book. I also remember Tomac’s comments to the press saying if Dungey would be proud winning a championship by points handed to him then good for him (my words, but something to that effect). As it turned out, the points were not needed. That last race of the season was ridiculous. Tomac’s only chance of winning the championship was to take Dungey out of the race. Not finish ahead of him because the points spread was too great, but to make him a non-finisher, and that’s what he clearly set out to do. I don’t have a favorite rider, but Dungey should be given credit for handling the situation in a unusually mature manner. Musquin is probably one of the cleanest passers out there, when he makes even a semi-aggressive pass it seems news worthy. I like watching Tomac ride when he is in the zone, the guy is blindingly fast, he just needs to quit being a little punk when things don’t go his way. This is not the first time that team orders have resulted in a points swing. I recall Guy Cooper being the 1st in 14 years to deliver the 125cc outdoor championship on a bike other than a Honda. If it weren’t for Mike LaRocco sitting up and waiting for him to hand 2nd place in the 2nd moto to him, it never would’ve happened. The Unidilla fans were PISSED (I was there..) but that’s professional sports and that’s why there are Teams. His rough riding, along with Roczen’s injury were some of the things that drove Dungey to retire. There is no doubt Tomac is incredibly talented and more often than not the fastest man on the track, but his conduct last year when he repeatedly tried to cause Dungey to crash in his bid for the SX championship showed his true colors. It was an adult version of a temper tantrum and he should have been penalized. When Musquin put him on the ground a few races back I almost laughed. I know a lot of people have differing opinions on this but Musquins move was a lot less aggressive than what Tomac has done. Tomac can not win another championship of any kind and I will be fine with that. He’ll get it soon. Sometimes the burning desire to win every race clouds the long game. Anaheim 1 really did him in, as he was in the lead and pulling away and should have eased up a bit. Looking forward to a great outdoor season. He has more problems than just a crash here and there. This year Marvin also crashed at round 2, was injured and missed races, but was in it until the last race. Tomac was (even in theory) out of it by the 15th round. That is a huge, huge difference. He just – for what ever reason, it might be the bike – is not constantly good. And this happens every year, even in the years he has won. Look at outdoors last year where he won the championship and compare that run to Roczen’s, Dungey’s, Villopoto’s, etc. Some days Tomac was just mediocre, whereas the other champions never were.